With craft breweries blowing up in Vancouver, it’s great news that yet another passionate beer-centric business is on the verge of opening. 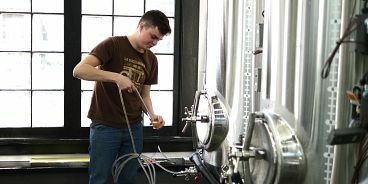 Steeltoad Brewpub sits at 2nd Avenue, between Ontario and Quebec in Olympic Village, and all their house beer is hand-crafted in small batches on-site. Due to the micro nature of operations, they’re able to make multiple beers at once — expect 10 house beers on tap at any given time as well as guest beers from local and foreign brewers. Just because beer is Steeltoad’s focus doesn’t mean other bevvies are ignored. Expect a classic cocktail program focused on local ingredients and high quality spirits. Unique local wines will also be on offer. As for food pairings, think fresh, Canadian cuisine using seasonal, local ingredients. A peek at Steeltoad’s Instagram feed reveals a red-tiled Woodstone pizza oven, mussels, smoked steelhead rillette and striploin. Steeltoad Brewpub is set to open early to mid September.